It was brought home to me this week that the cuts imposed by the NEW Devon (Northern, Eastern and Western Devon) Clinical Commissioning Group (CCG), which is in charge of our local health service, mean that GPs can’t refer patients to specialists for many ‘routine’ conditions – which may nevertheless be conditions which cause considerable discomfort and even risk serious complications down the line. So although the Group says it is ‘prioritising’ the NHS Constitution commitment to ‘consultant-led treatment within a maximum of 18-weeks from referral for non-urgent conditions’, the real wait for patients will be much longer – because you’ll have to become ‘urgent’ to get referred in this first place! In the bad old days you had to wait, but at least you knew you were on the list. Now you can’t even get on the list, not because there isn’t a specialist available, but because the list for your condition simply doesn’t exist in our area. It does in other areas, of course – it’s a postcode lottery. This situation is partly caused, Independent County Councillor Claire Wright suggests out in her latest column in the Express and Echo, by the expensive, pro-privatisation NHS reorganisation forced through by David Cameron’s former health secretary Andrew Lansley. UPDATE: Owen Jones reports that CCGs elsewhere in the country are paying GP practices NOT TO REFER patients. The battle for Pendeen, the modest but attractive seafront bungalow on Castle Hill which its owner wants to replace by a block of 3 flats, was lost at East Devon’s Development Management Committee yesterday. The DMC had refused a very similar application in April (by 7-6), but the same committee has now approved the replacement (6-4, with three Independent members unfortunately absent). Seaton’s voice was once more unanimous: Marcus Hartnell for the town council, his fellow district councillor Jim Knight, Pendeen neighbour Jean Hoskin, and myself for the many individual objectors, backed up by Peter Burrows on the committee, all opposed the application, but we were overridden by Tory councillors from other areas. How could local opinion be so ignored, and the committee’s own recent decision be set aside? The simple answer is that planning officers, who supported the original application but were overruled by the majority of members, provided ammunition for councillors supporting the bid to overturn the first decision. Two disturbing distortions in the officers’ case were highlighted by councillors who opposed the application. First, they quoted the National Planning Policy Framework’s paragraph 60 to the effect that we ‘should not stifle innovation, originality or initiative’. 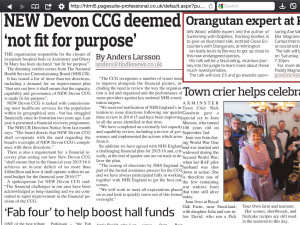 However Councillor Mike Allen (Conservative, Honiton) objected that they had omitted the conclusion to the NPPF paragraph: ‘It is, however, proper to seek to promote or reinforce local distinctiveness.’ Allen said that he did not appreciate officers quoting selectively to buttress a particular case. How did the committee come to its decision despite these failings in the pro-application case being pointed out? The majority of members simply did not respond to either Allen’s or Burrows’ points, they did not respond to most of the objections made by the Seaton representatives, and they did not address point by point the 3 good reasons for refusal that their own committee had given as recently as April. Mostly these councillors thought it sufficient to give their opinions: Councillor Alan Dent, the former Design and Heritage Champion, ‘liked’ the proposed building, his successor, Christopher Pepper, agreed with him without expanding his own view, and other members chipped in briefly before voting the proposal through. Why do councillors act like this? They are not simply biased against Seaton, as the same thing happens to applications from other areas. They are not necessarily corrupt (in the sense highlighted by the Graham Brown case). The key, probably, is that they don’t want the trouble of appeals, highlighted as a danger by the officers in this case. Group-think does the rest: the Tories are happy to let individual councillors like Jim and Marcus speak for their constituents, and more independent minds like Mike Allen have their say, as long as the rest of them can vote us down. We have no real redress against the Committee’s failure to consider the matter carefully or fairly. The applicant, if he had lost, could have appealed. Objectors can only seek judicial review – a right the Tory Government is trying to curtail – which would cost probably tens of thousands of pounds if EDDC spent taxpayers’ money to cover their own failings. This entry was posted in Uncategorized and tagged EDDC DMC, Pendeen. This is the body which oversees Seaton Hospital too. This is the group that is top-heavy with jargon-speaking managers behind the closure of community hospital beds. Can we now expect to see a re-assessment of that decision? This entry was posted in NHS and tagged NEW Devon CCG.